Samantha and Doug are a fun loving couple and Max and I were honored to be part of their big day. They chose a masquerade party approach with masks, feathers and an amazing dress! We started out at Samantha's mom's house in Lake Geneva for some getting ready photos. Then we went to Grand Geneva for the first look before having the ceremony at the Lake Geneva United Methodist Church. After shooting the ceremony we moved into an extended wedding party session and we started that at The Riviera. There were lots of other weddings in addition to the Lake Geneva Marathon and prom that day! But the hustle and bustle only added to the excitement and fun! After the Riv we went over to Yerkes Observatory to shoot some additional shots with the amazing architecture and bold beautiful skies we had on Saturday. Finally we went to the reception at Hawk's View Golf Club. The food was amazing and the entertainment was provided by Midwest Sound. Samantha's over the top dress was designed by San Patrick. To view the hi-res images from this wedding follow this link. Lake Geneva, May 2011 Wedding including The Riviera, Yerkes and Hawk's View. 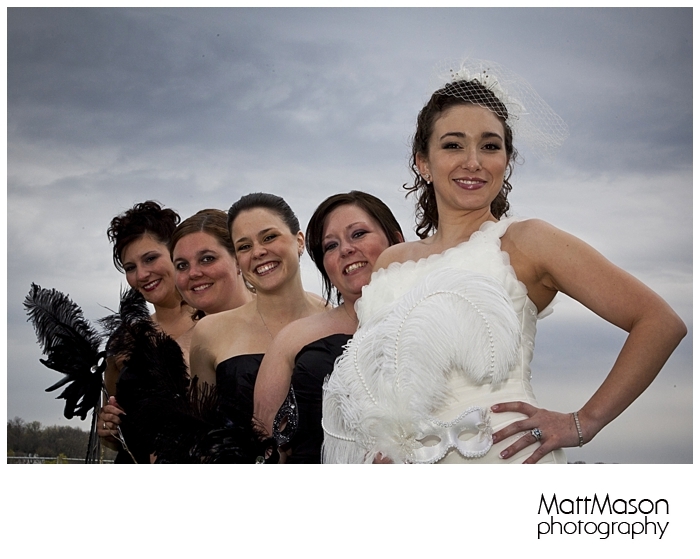 Max Biedermann was the lead photographer for this wedding and in my humble opinion did a fantastic job. It was fun and challenging to serve as the second shooter/assistant for once. We welcome comments on Facebook. Click here to view photos on Facebook.